Have you ever been wrapped in a loving hug that you don’t want to let go of? For me, there are immediately individuals I think of whose embrace is something I won’t soon forget. So many of those hugs are like hugs from a giant teddy bear who won’t let go. These longing embraces are something I want to hang onto and never let go because there is just something about their embrace that makes you feel strong and secure. That’s the thing friends I want to embrace everything God has given me. I want to be better about savoring the every day moments and putting the phone and social media away as I simply bask in the moment. I want to embrace life as a single 37 year old. I want to embrace life and be the best daughter, granddaughter, niece, sister, friend etc that I can be! I want to remember that life is about taking stock of our blessings and embracing ourselves in those blessings. I think so often it is hard to embrace each day because it doesn’t turn out like we expect it to but God wants us to embrace him and trust him. God wants us to embrace the life God has given us. That is never easy but indeed “there is a time to weep, a time to mourn, a time to plant, a time to pluck up what was planted” and so much more. Embracing can be so scary too. Embracing change often causes us to catch our breathe, doesn’t it? Embracing anything can be so hard yet that’s what I believe God is calling me to do this year. God embraced the cross by sending Gods one and only son into the world for us and so we are called to embrace life too. So this year, it is my prayer to embrace the “beautiful uncertainty (Thanks Mandy Hales)” of it all. For it is in that uncertainty, that we truly begin to embrace and enjoy life. I love this quote I found on Pintetest, “Embrace uncertainty. Some of the most beautiful chapters in our lives won’t have a title until much later.” (Author: BG) Amen! May I find time to embrace each day, each hour, and each moment that comes my way this year. Have you ever noticed how much of life is about waiting? We wait in the drive thru line at the fast food store. We wait in the waiting room at the doctor and/or dentist’s office.We wait for those we love. We wait for packages and fun snail mail to arrive in the mail. We wait at the airport. The truth is that we actually wait a lot in our lives. Yet, I don’t know about you, but for me, I have a hard time waiting. I can get pretty impatient. And when it comes to God answering my prayers and/or the desires of my heart, it seems like my patience meter runs even shorter. I want it to be answered right now! Yet God doesn’t answer our prayers or the desires of our heart like that, does God? God has a plan in store for each and every one of us. 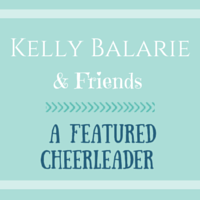 I am reminded of a Tweet from my blog friend Kaitlyn “God has a very, very good plan. We may not understand it, but that doesn’t make it any less good.” Oh how I need to cling to those words in the waiting! Sometimes it seems like those plans are coming into place for every one but me. Just a few weeks ago, a camp friend got engaged. I am so excited for her. Her fiance is a single dad so she gains an instant family. Then on Thanksgiving, a good friend was proposed too. My heart and head have a hard time holding my emotions during these joyous occasions because part of me is so excited for them while another part of me feels deflated. Yet Advent is all about waiting, isn’t it? My friend Susan gifted me an early release copy of Mandy Hale’s book “A Beautiful Uncertainty.” She knew her words were exactly what my soul needed. My favorite chapter is a chapter titled “Advent, Single, and Waiting” Funny thing is that I read that chapter just as Advent was nearing. Because Advent is indeed all about waiting. We wait for this Word, born of flesh, Emmanuel! Like Mary, we ponder and treasure all these things in our hearts. Like the shepherds, we wait and find the baby Jesus lying in the manger. Like the wise men, we wait and bring the Messiah gifts of gold, frankincense, and myrrh. We wait for this one who is sent into the world to bring hope and peace and joy and will later die on a cross for our sins. We wait because we trust in a God who fulfills God’s promises! Yes, a God who fulfills God’s promises. Those are important words for us all to cling to and remember especially during this Advent season. Much like we await the birth of Jesus, I find myself waiting and clinging to God’s promises to me. I may not know the day nor the hour but God has a plan for me and each and every one of us. In fact, it may not be the plan I have pictured for myself but it is the plan God has designed specifically for me. And that plan is oh so good! May we all wait and hold onto the hope of our faithful God who is always ever faithful especially as we wait and watch for this precious baby boy born in a stable in Bethlehem oh so many years ago..this holy child who comes to remind us of God’s love and faithfulness for all God’s people. 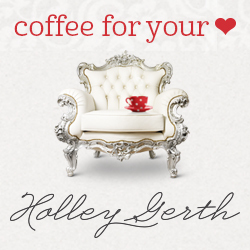 I am linking up with these beautiful faith-filled women: Holly at Testimony Tuesday, Kelly and the RaRa Linkup, Jennifer and Tell His Story, and Holley and Coffee for your Heart. 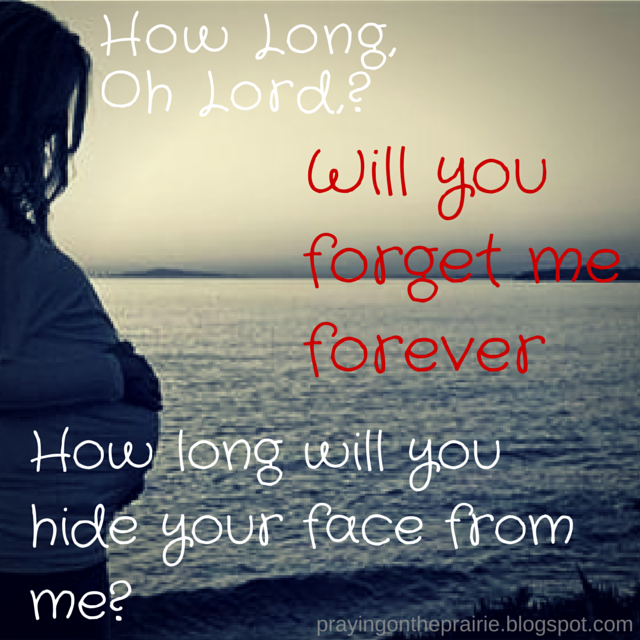 “How long, Oh Lord, will you forget me forever? Oh how these words penetrate my heart. I so deeply yearn to be a wife and a mom, but at long last, I am still a single woman. I love my job and my life, yet there is something that I so deeply wish for. It is an area of my life where I always find myself looking for God’s grace because this is not at all how I pictured my life. I scroll through my Facebook feed and read the news of a new birth, a new home, a new engagement, a new marriage…. I will admit that I am extremely happy for these friends and family. Yet my heart hurts so deeply. It is brokenhearted! And there is not enough chocolate to cover the pain of this ache in my heart. I want to hold my own child in my arms. I want to spend my Friday night cuddled up to someone special. But what if that is not the story God has for my life? And if that is not the story God has for my life, I have to remember to receive God’s grace with open hands. That is not an easy pill to swallow. Yet in all truth, I know that God is finding ways to show God’s grace to me. God has a way of showing up in the most unexpected places and in the most unexpected people. Just the other day, I returned home from a weekend at a youth gathering. In my mailbox, there was bills and other junk mail, but there was also a package wrapped in brown paper packaging that caught my eye. I set the mail down and put away my clothes etc. After opening all of my mail, I finally opened my package. It was a gift from my friend Susan that she got while she was attending Allume. 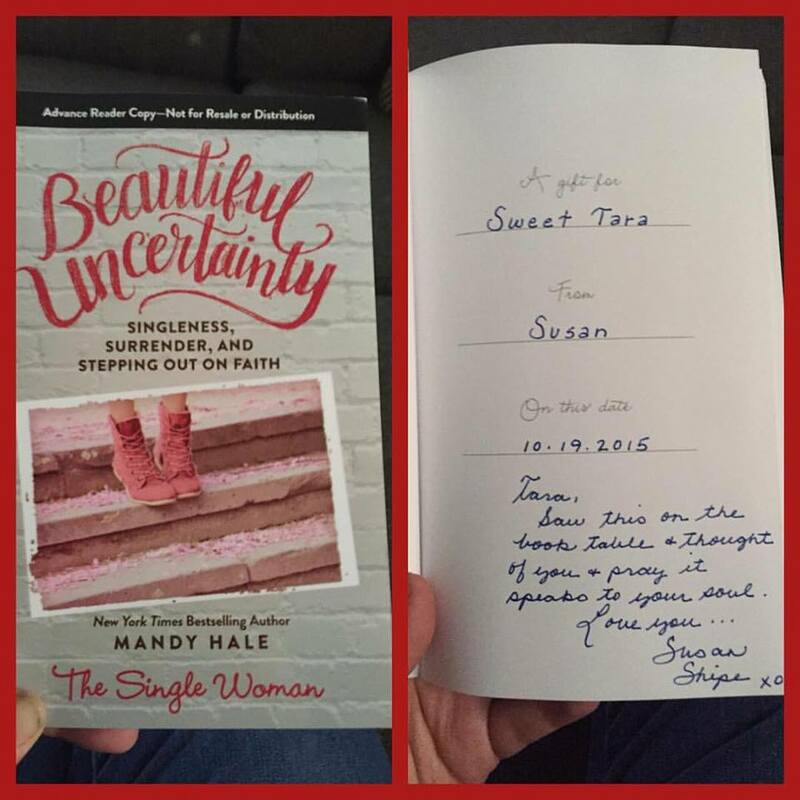 The gift was a book titled “Beautiful Uncertainty: Singleness, Surrender, and Stepping Out on Faith” by Mandy Hale. The book actually is an advanced reader copy. I thought I was going to have to wait for the book to come out, but Susan thought of me and sent this book and sweet note in the inside cover. Her words “I pray it speaks to your soul” are another gift of God’s grace in my life! There are days in this single life of mine that my life is not so grace-filled at all! I question where God’s grace is in the midst of yearning and questioning if God will EVER answer the deepest desires of my heart or if I will have to surrender knowing that this is not the story God has in store for my life. I honestly don’t think God would give me these deep desires for so long if they weren’t going to be eventually answered in my life. The single life can be so lonely. The single life can be so full of waiting and wondering. The single life can be so full of uncertainty. Yet the single life, especially when it feels like it is not so grace-filled, is more grace-filled than I can ever imagine! God has a way of showing me God’s grace through one of the hardest seasons of my life. And knowing that, I trust and wait for the gift of grace in the midst of this season of singleness in my life. Yet there are days that is so much easier said than done. No amount of chocolate or peppermint ice cream will make up for God’s grace which is always and ever enough! Readers, don’t forget to register to win a $500 DaySpring shopping Spree. 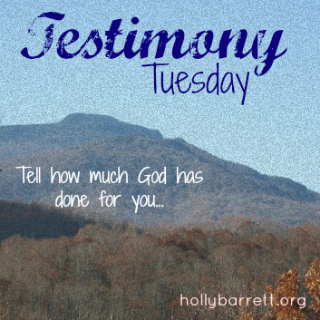 Today I am linking up with some of my favorites: Holly and Testimony Tuesday, Kelly and the RaRa Linkup, Jennifer and Tell His Story, and Holley and Coffee for Your Heart.